The team at Nigel Waters Hardware are looking forward to meeting all customers, old and new. We will have our full range on display, focusing on the UPVC locking replacement market and its associated products – all with fantastic offers and deals. 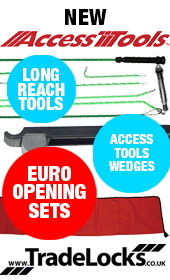 We will also have a number of innovative KITs to show you, all aimed at making your job easier. Keyprint (established in 1980) is a leading supplier to the Locksmith, Architectural Ironmonger, Hardware, Heel Bar, Key Cutting, Security and OEM trade for over 30 years. Our business has been built over the years with excellent relationships, service and knowledge of products that we supply to our customers. OOPS! IF YOU RECEIVED LAST WEEK'S LASN AGAIN YESTERDAY IT WAS BECAUSE THE ISSUE WAS SO GOOD WE THOUGHT YOU'D WANT TO SEE IT AGAIN! NOT. I'M AFRAID WE HAD A TECHNICAL GLITCH KNOWN AS A JOHN AUSTEN. MY APOLOGIES. NEW Keyline car key cloning accessories available at Tradelocks at special introductory prices - for a limited time only! From ID48 cloning machines, to can chips, electronic heads and horseshoes; Tradelocks has it all covered when it comes to car key cloning machines and accessories. Supplying all the products an auto locksmith needs to carry out successful cloning services. More than half of the UK population are very concerned about their houses being burgled, but Brits are only taking very basic measures to protect their properties, according to new research. 53% of Brits said that they were worried about their homes being broken into, with 47% of these saying it is a regular concern and 6% admitting that they worry about it all of the time. MOBOTIX has released an enhanced version of the intuitive Video Management Software platform, the MxManagementCenter for Windows and MAC. The latest version has been optimised to provide a full range of functions required for an efficient and professional video surveillance management.